A more detailed look at I wore to the London Edge tradeshow in my previous post. I've never thought to pair yellow and pink together but I was inspired by print on this shirt and ended up really liking the combination. The shoes are a Topshop sale purchase that you might remember from some of my older posts, I never thought I'd have gotten this much wear out of a pair of yellow shoes but I've been pleasantly surprised. They're become a welcome sight against the often damp and dreary London cobblestones. Looove this colorful combo! You can totally pull it off! Such amazing colours, you look BEAUTIFUL! These colours are so lovely together! I love how colourful and fun this outfit is! That skirt is fab! I can't believe yellow and pink could look so good!!! definitely trying that out next time! 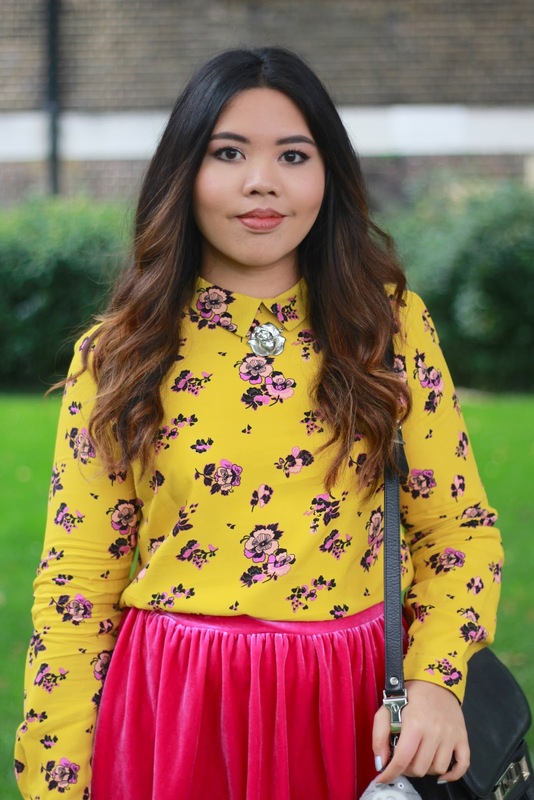 x A.
AAMZZZING yellower floral blouse and shoes! And the combo of the pink skirt rocks!!! SOOOO cool, vibrant colourful and I have that totoro toooo---toooo cute! Girl no one can wear color like you! You are totally rocking this look, obsessing over the shoes! You look so pretty in yellow! And your Totoro keychain is just too cute <3 Hugs!